Is Meth Rehab Aftercare Necessary? What is Meth Rehab Aftercare? Aftercare is a form of ongoing support, that may include counseling interventions, medical care and/or educational programs that can help one maintain sobriety once treatment is complete. Recovery from meth addiction is a process that involves the interplay of an individual's actions; societal reactions; and positive and negative life events. This process can be facilitated by ongoing counseling and support, offered once the individual has quit using and is trying to maintain sobriety. This phase of addiction treatment--known as 'aftercare'--is aimed at preventing relapse to methamphetamine use and supporting a drug-free lifestyle. Aftercare for methamphetamine is offered after the initial treatment phase and can be extended for as long as needed. Some aftercare programs, on the other hand, offer the interventions for a relatively shorter period of time. At times, these programs are mandatory, for example for drug-using offenders diverted to an aftercare program for their drug use. Cognitive behavioral therapy (CBT), contingency management (CM), and the Matrix Model are some of the aftercare interventions found effective in improving retention in treatment, reducing methamphetamine abuse, delaying relapse and encouraging abstinence, improvement in employment status and reduction in use of other drugs among methamphetamine users. Additionally, aftercare interventions have been found effective in reducing HIV risk behavior, psychiatric symptoms of paranoia and depression, and engagement in criminal activities. Methamphetamine relapse prevention is aimed at helping the individual prepare to deal with the high risk situations likely to lead to lapse and subsequently relapse. The high risk situations can be internal (mood states, thoughts related to drug use, etc.) or external (interpersonal or other environmental stressors). The relevance of relapse prevention management in methamphetamine recovery is supported by high relapse rate among those trying to quit. Between 35 and 60 percent of methamphetamine users registered in publicly-funded residential or outpatient treatment programs have been found to relapse with up to 36 percent of these relapsing within the first six months. Older age of first drug use. Feeling a lack of empowerment. On the other hand, longer duration of the initial treatment episode and participation in self-help or other treatment during the post-treatment abstinence period have been found protective against relapse - an observation that supports the role of aftercare and relapse prevention in management of meth addiction. Drug addiction, including methamphetamine addiction, is conceptualized as a chronic disorder; over a long course, periods of remission (abstinence) may be punctuated by the occasional relapse into drug using behavior. While abstinence remains the ultimate goal of any treatment program aimed at addressing methamphetamine addiction, there is more to the process of recovery. Experience with methamphetamine users over the years has shown that relapse is not an unlikely event on the road to recovery, although aftercare helps reduce its chance or delay it. Genetic vulnerability has been associated with both methamphetamine addiction (like other chemical addictions) and diabetes mellitus. Avoiding a drug-using peer group or other high-risk situations play an important role while one is trying to quit methamphetamine. Similarly, following the dietary restrictions and exercise regimen are of utmost importance to ensure glycemic control in diabetes. Ensuring therapeutic adherence is also a challenge for both the conditions. In the case of diabetes, less than 60 percent of individuals remain fully adherent to their treatment. Similar low rates of treatment compliance are seen among methamphetamine users as well. Almost 30-50 percent of adult patients with type 1 diabetes have a recurrence of symptoms each year. A high relapse rate of up to 60 percent has been reported for methamphetamine users. This recurrence of symptoms and relapse for chronic medical disorders as well as amphetamines addiction highlight the importance of continued ongoing care that needs to be adapted to the changing needs and requirements of the individual. Treatment for diabetes lasts for years, and requires life-long management. Similarly, recovery from methamphetamine addiction requires vigilance and sustained efforts at relapse prevention. Relapses--while certainly a setback to recovery--are inherent to the concept of all chronic medical conditions. Relapse, if it occurs, should be viewed as a signal to revisit the management plan and make needed treatment improvements. Continuing care for methamphetamine users refers to interventions offered beyond the initial phase of treatment with an aim to prevent relapse and encourage drug-free lifestyle. Counseling and support, similar to that encountered in a structured treatment program, is continued throughout the aftercare period. Relapse prevention strategies using a combination of motivational interviewing (MI) and CBT have elicited an overall decrease in methamphetamine use and a significant increase in abstinence in the treatment groups (when compared to a self-help booklet control group). CBT techniques for methamphetamine users can be administered successfully in both individual and group settings. Research trials of CBT have additionally reported improvement in co-occurring depression among methamphetamine users post-treatment. One research study compared the Matrix model--which included 16 weeks of group CBT, group family education, group social support and individual counseling--with treatment as usual and found increased attendance, more drug free individuals as assessed by drug screen monitoring, and longer periods of abstinence during treatment among the Matrix group. Another study assessed effectiveness of relapse prevention and MI among individuals directed to therapy by court. It showed an increase in self-efficacy among the intervention group as compared to the no therapy group. 12-step facilitation treatment for methamphetamine users, known as Crystal Meth Anonymous, is a self help program. It is based on a set of guiding principles outlining a course of action for tackling methamphetamine addiction whereby recovery is sought across multiple domains - spiritual, emotional, mental, and physical. One admits the problem with addiction and being powerless to meth, and works through the subsequent steps. 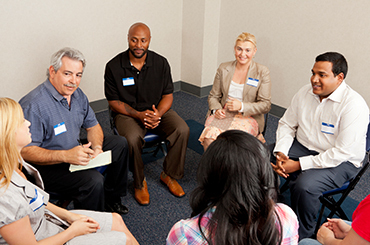 One learns from the experience of others as members are encouraged to share their stories of recovery, and problems they may have encountered along the way. Such 12- step programs have been found to complement the benefits of professional addiction treatment. Treatment outcomes as they pertain to 12-step programs and methamphetamine use has not been thoroughly explored. However, the approach has been found to be effective with users of other stimulant drugs such as cocaine and has been reported to hold promise for methamphetamine users as well. Retention and regular attendance in meetings is expected to be a challenge based on experience with similar programs for other stimulant drugs. Self Management And Recovery Training (SMART recovery) is an alternative model which integrates the self-help, mutual support model with elements of CBT. The development of medicines for use as aftercare management of methamphetamine dependence is still in its early phase. Different medicines, including substitution agents as well as anti-craving agents, have been explored and have shown promise in preliminary trials. In spite of lack of a well established pharmacological option, aftercare for methamphetamine users still may require follow-up medical care. Effective management of these health conditions shall warrant follow-up medical care. Severe dental problems (meth mouth). Contracting infectious diseases like HIV and hepatitis B and C.
Therapeutic communities offer a structured program where the individual remains at a residence for an extended period of time. The residents fill important roles as client, role model, counselor, supervisor, and tutor while passing through stages of their own recoveries. TCs offers a long stay facility to recovering individuals who have quit drug use and look forward to a drug free life. Residents learn through social interaction and the accumulation of successful accomplishments to build self-esteem and self-efficacy - both vital components to strong recovery. Research seems to indicate that TCs are an effective treatment intervention for methamphetamine users as compared to treatment as usual. Furthermore, reduced substance use, criminal activity as well as improvement of mental and physical health among those completing these types of programs has been observed. Male methamphetamine users engaged in modified therapeutic community in a prison setting have also been found to have improvements in psychosocial functioning and criminal thinking. Retention, however, remains a challenge for this modality of aftercare; less than half of those enrolled eventually complete the program. Contingency management (CM) aims at preventing or reducing drug use by using positive reinforcement in the form of vouchers or other benefits, exchangeable for goods or privileges and cash rewards for drug free behavior. CM when offered alone or in combination with CBT has been found to improve retention in treatment, more drug free urine samples and longer period of abstinence. In a randomized controlled trial comparing CM, CBT and combination of CM and CBT among methamphetamine and other stimulant users. CM produced better retention and lower rates of stimulant use during the study period and was comparable to CBT in efficacy. CM, when offered alone or in combination with CBT, has also been found to increase treatment retention, ensure longer period of consecutive methamphetamine-negative urine test and improved addiction levels among homosexual and bisexual men who were methamphetamine dependent. To know more about the aftercare options for meth addiction call us at 1-888-993-3112Who Answers? and talk to a member of our treatment support team. The impact of meth addiction extends beyond the user and can deeply affect family and friends. However, both family members and friends of methamphetamine users can play a great role in the process of recovery from methamphetamine addiction. You can get educated on meth addiction and that will help you understand the problem better. You can play an important role in improving therapeutic adherence by reminding your loved one of the appointments. You can help support an individual's sobriety through emotional support and by being attentive to the possible high risk situations conducive to future relapse. Caring for a recovering addict can be challenging and emotionally draining. Sharing your feelings with significant others can help all involved parties. Self-help groups exist with the purpose of ushering family and friends of drug users through these potentially tumultuous times. If you're a friend or relative of someone suffering under the weight of meth addiction, call 1-888-993-3112Who Answers? to inquire more about beneficial methamphetamine addiction treatment options. Vocci FJ, Montoya ID. Psychological treatments for stimulant misuse, comparing and contrasting those for amphetamine dependence and those for cocaine dependence. Current opinion in psychiatry. 2009;22. http://www.ncbi.nlm.nih.gov/pmc/articles/PMC2825894/. Hser Y-I, Evans E, Huang Y-C. Treatment outcomes among women and men methamphetamine abusers in California. Journal of substance abuse treatment. 2005;28:77-85. http://www.sciencedirect.com/science/article/pii/S0740547204001308. Rawson RA, Huber A, Brethen P, et al. Status of methamphetamine users 2-5 years after outpatient treatment. Journal of Addictive Diseases. 2001;21:107-119. http://www.tandfonline.com/doi/abs/10.1300/J069v21n01_09. Brecht M-L, von Mayrhauser C, Anglin MD. Predictors of relapse after treatment for methamphetamine use. Journal of psychoactive drugs. 2000;32:211-220. http://www.tandfonline.com/doi/abs/10.1080/02791072.2000.10400231. Bishop S. Epidemiology and treatment of methamphetamine abuse in California: A regional report. Los Angeles, CA: National Evaluation and Technical Assistance Center Retrieved April. 1999;17. https://scholar.google.co.in/scholar.ris?q=info:ZlKu35gF-zsJ:scholar.google.com&output=cite&scirp=1&hl=en. Tuliao AP, Liwag MECD. Predictors of relapse in Filipino male methamphetamine users: a mixed methods approach. Journal of ethnicity in substance abuse. 2011;10:162-179. http://www.tandfonline.com/doi/abs/10.1080/15332640.2011.573319. Brecht M-L, Herbeck D. Time to relapse following treatment for methamphetamine use: a long-term perspective on patterns and predictors. Drug and alcohol dependence. 2014;139:18-25. http://www.sciencedirect.com/science/article/pii/S0376871614007728. Thomas Mclellan A. Drug Dependence, a Chronic Medical Illness. JAMA. 2000;284:1689-1695.https://scholar.google.co.in/scholar.ris?q=info:Vu2J8pHXhoQJ:scholar.google.com&output=cite&scirp=0&hl=en. Baker A, Boggs TG, Lewin TJ. Randomized controlled trial of brief cognitive-behavioural interventions among regular users of amphetamine. Addiction. 2001;96:1279-1287. http://www.ingentaconnect.com/content/carfax/cadd/2001/00000096/00000009/art00007. Baker A, Lee NK, Claire M, et al. Brief cognitive behavioural interventions for regular amphetamine users: a step in the right direction. Addiction. 2005;100:367-378. http://onlinelibrary.wiley.com/doi/10.1111/j.1360-0443.2005.01002.x/full. Rawson RA, Marinelli-Casey P, Anglin MD, et al. A multi-site comparison of psychosocial approaches for the treatment of methamphetamine dependence. Addiction. 2004;99:708-717. doi:10.1111/j.1360-0443.2004.00707.x. Yen C-F, Wu H-Y, Yen J-Y, Ko C-H. Effects of brief cognitive-behavioral interventions on confidence to resist the urges to use heroin and methamphetamine in relapse-related situations. The Journal of nervous and mental disease. 2004;192:788-791. http://journals.lww.com/jonmd/Abstract/2004/11000/Effects_of_Brief_Cognitive_Behavioral.10.aspx. Kobayashi O. [Treating drug dependent patients through outpatient group therapy-Serigaya Methamphetamine Relapse Prevention Program (SMARPP)]. Seishin shinkeigaku zasshi= Psychiatria et neurologia Japonica. 2009;112:877-884. http://europepmc.org/abstract/med/21077296. Donovan DM, Wells EA. "Tweaking 12-Step": the potential role of 12-Step self-help group involvement in methamphetamine recovery. Addiction. 2007;102:121-129. http://onlinelibrary.wiley.com/doi/10.1111/j.1360-0443.2007.01773.x/pdf. Magor-Blatch L. Intervention for Amphetamine-type Stimulant (ATS) Use in the Therapeutic Community. 2013. https://scholar.google.co.in/scholar.ris?q=info:T7v8SHRNFRsJ:scholar.google.com&output=cite&sci rp=0&hl=en. Joe GW, Rowan-Szal GA, Greener JM, Simpson DD, Vance J. Male methamphetamine-user inmates in prison treatment: During-treatment outcomes. Journal of substance abuse treatment. 2010;38:141-152. http://www.sciencedirect.com/science/article/pii/S074054720900141X. Rawson RA, McCann MJ, Flammino F, et al. A comparison of contingency management and cognitive-behavioral approaches for stimulant-dependent individuals. Addiction. 2006;101:267-274. http://onlinelibrary.wiley.com/doi/10.1111/j.1360-0443.2006.01312.x/pdf. Shoptaw S, Reback CJ, Peck JA, et al. Behavioral treatment approaches for methamphetamine dependence and HIV-related sexual risk behaviors among urban gay and bisexual men. Drug and alcohol dependence. 2005;78:125-134. http://www.sciencedirect.com/science/article/pii/S0376871604002868.